OMEGA's new precision-machined adaptors, connectors, and stopcocks can be easily integrated with a variety of assemblies and test apparatus. They are used in industrial and laboratory applications where precision luer-type connectors are required. Provide secure connections and easy disconnect applications for your fluid handling and Luer-fitting needs. Made of nickel-plated 360 brass. Pressure manifolds make it possible to design a miniature piping system utilizing various luer connections. Flushing manifolds allow liquids to be flushed through needles, catheters and other components. The manifolds are made of nickel-plated 360 brass . OMEGA’s extensive selection of pressure monitoring manifolds allows the user to create his own miniature piping systems utilizing various luer connections. The sturdy metal base with metal luer fittings can be sterilized for repeated, reliable, economical service. 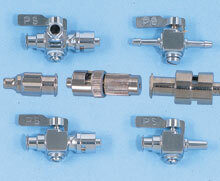 All pressure monitoring manifolds are made of nickel-plated 360 brass. These high quality, leak-proof luer fittings are manufactured to the ANSI/HIMA MD70.1 standard. Luer stopcocks are made of Type 360 Brass and are chrome-plated. These stopcocks are easily integrated into assemblies with other stopcocks, manifolds, adaptors and glass syringes. These jumbo glass syringes meet the highest standards of accuracy and uniformity and are a staple in laboratory and industrial applications. The body and plunger are made of borosilicate glass for corrosion and heat resistance.